You’re an ape. One of the ways we know this is by looking at our foot. All apes, including us, walk with the whole sole of our foot on the ground. On the other hand (or foot), other primate groups only use part of their sole1. This unique, sole-based way of walking has the fancy technical term of “plantigrade” (plant being Latin for sole). It’s how all mammals walked originally, but since then some lost it (like dogs), some kept it (like rodents), and some re-evolved it (like us)1. Nowadays, we think it’s pretty great because it helps us walk upright. 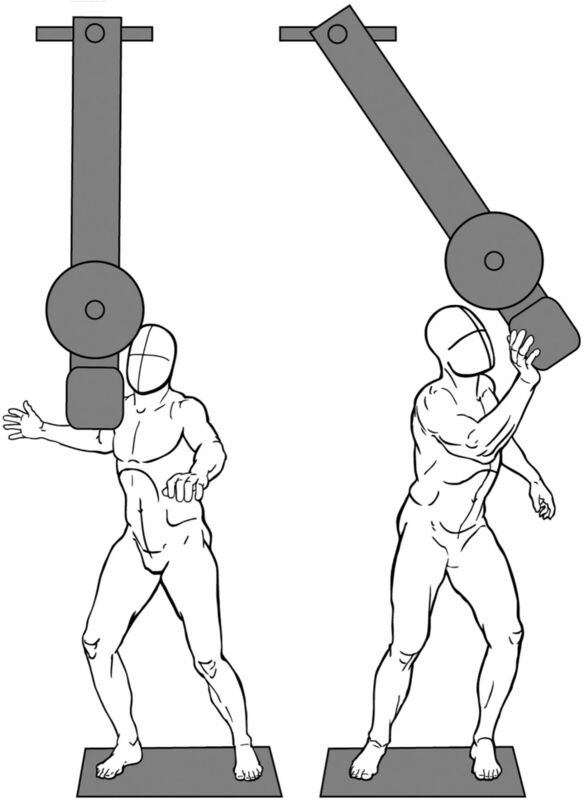 In particular, the plantigrade foot can form a rigid lever for pushing off the ground2. But how did apes get a plantigrade foot in the first place? The fact we all have it means it likely evolved in our common ancestor and we inherited from them. The common ancestor of all the apes lived around 15 million years ago3. What were they doing with a plantigrade foot? New research claims the answer is “fighting”. Modern apes can get pretty fighty. Even famously peaceful bonobo has been seen engaging in fisticuffs – although they prefer to resolve disagreements with, as the study labels it, “rump contact”4. Gorilla fights look the worst though. Whichever ape fight you happen to be watching, there are some key similarities. Notably, a lot of combat takes place with the whole sole planted firmly on the ground. This led researchers to speculate that using plantigrade feet provides some advantage in combat, perhaps explaining why they initially evolved1. Specifically, they thought that plantigrade feet would mean a larger contact between ground and fighter. This serves to increase the friction between foot and ground, providing a more stable foundation for larger body movements. No use being able to throw a big kick if you’re going to topple over in the process1. Unfortunately, testing these ideas on all those fighty apes could be dangerous. So instead, they turned to humans to see if plantigrade posture really helped them exert more force in a fight1. Not saying that humans aren’t dangerous, they’re just easier to trick into taking part in your experiments. You can probably guess what happened next. They took a bunch of human volunteers and measured the force they could exert with their feet in different postures. Specifically, they tried to recreate the movements you’d need to exert to be good in a fight. Efforts to depict their method led to one of my favourite scientific diagrams ever – a crash test dummy slapping a giant metronome. Of course, they used real people for the experiment. And the results showed pretty much what they expected, with people in a plantigrade posture able to exert more force than those standing on their tiptoes. Specifically, plantigrade people could produce 165% as much force as their tiptoe counterparts1. As an interesting aside, tiptoe posture has the technical name “digitigrade.” You probably recognise the digit in there as, well, “digit” (the term for fingers and toes). But did you know digit, as in a number, has the same Latin root since you count digits on your digits. Etymology lessons aside, the researchers took the increased force made possible by a plantigrade posture as evidence the plantigrade foot did evolve to help apes fight. However, there are a few reasons why we should be dubious about these results, and thus the inference that plantigrade posture was an adaptation for fighting. The big problem is the scope of the experiment. Only a small number of humans took part in the metronome pushing. Small sample sizes (~12 people in this test1) are a problem in their own right, but their focus on humans is also problematic. After all, we’ve been walking and fighting plantigrade our whole lives. Plus, being apes, our whole body evolved around plantigrade posture too. In other words, you’d expect us to do well plantigrade simply because that’s the way we have the most experience (and natural ability) moving. Concluding plantigrade is better for fighting based on that is like concluding you can’t move fast on four legs because humans can’t. Cheetahs would like to have a word with you. Of course, this doesn’t mean their hypothesis is wrong; just unproven. But in science, that’s perhaps worse. Carrier, D.R. and Cunningham, C., 2017. The effect of foot posture on capacity to apply free moments to the ground: implications for fighting performance in great apes. Biology open, 6(2), pp.269-277. Susman, R.L., 1983. Evolution of the human foot: evidence from Plio-Pleistocene hominids. Foot & ankle, 3(6), pp.365-376. Finstermeier, K., Zinner, D., Brameier, M., Meyer, M., Kreuz, E., Hofreiter, M. and Roos, C., 2013. A mitogenomic phylogeny of living primates. PloS one, 8(7), p.e69504. Furuichi, T., 1997. Agonistic interactions and matrifocal dominance rank of wild bonobos (Pan paniscus) at Wamba. International Journal of Primatology, 18(6), pp.855-875.